8/31/18: Graysea knocked it out of the park again with a full male sibling to Liberty's Magna Carta! 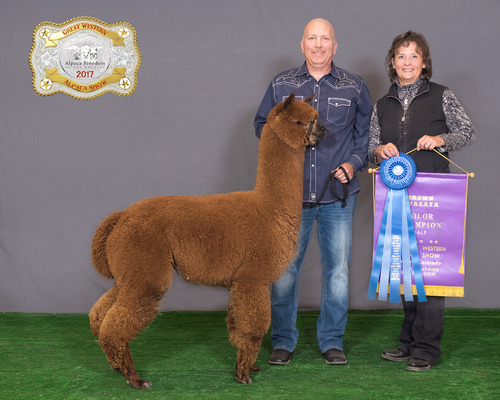 Graysea is a 9X Champion, beautiful modern dark rose grey female sired by 2010 Futurity Champion Crystal Spartan and champion winning and producing Majestic Peruvian Golden Crystal, a beautiful fawn daughter of multiple Herdsire of the Year Majestic Peruvian Jeremiah. 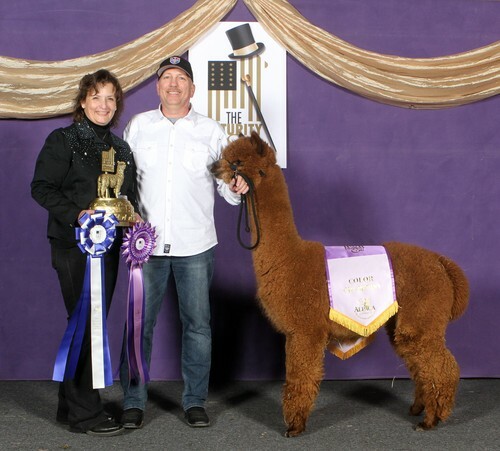 The 2018 show season was definitely the year for Manassas with multiple championships again and finishing his career with a Judges Choice! 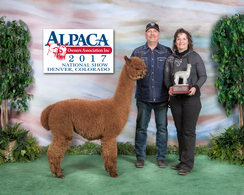 This compact male has extraordinary fleece - and brings along density, crimp and uniformity! UPDATE: Her first cria, Manifest_Destiny just took a Color Championship at Alpacapalooza and Reserve Championship at the AOA National Show in his first two shows! 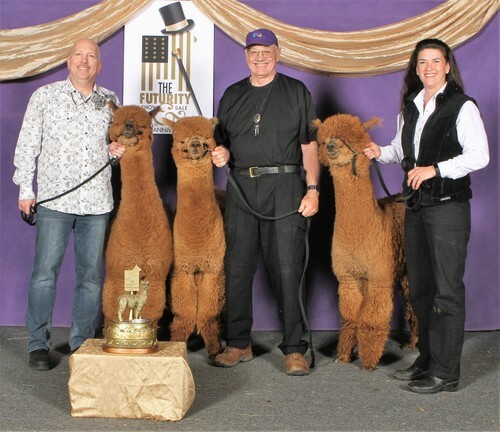 Liberty’s Magna Carta -- what a befitting name to this EXCEPTIONAL young female, who swept the competitive show ring and garnered AOA National Supreme Dark Champion, 3X Judges Choice Awards, & won in the Futurity Get-of-Sire Champion trio 2X. Did we mention she’s a 15X Champion! Magna Carta is an EXTRAORDINARY alpaca and very special indeed. Now she has proven she can produce elite offspring, and we have her son by the incomparable mega champion Snowmass Mr Sizlin Rose. Magna Carta is the epitome of what the best is! 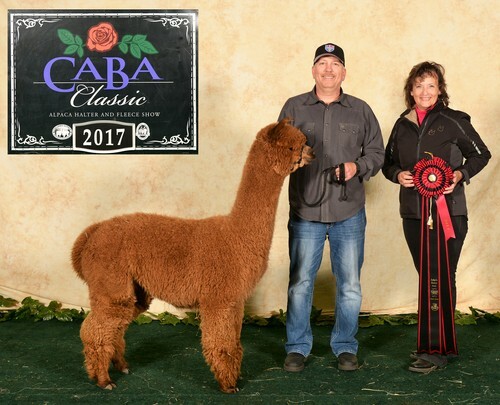 Quality genetics such as these rarely make themselves available but for serious breeders – she will take your program to the next level! 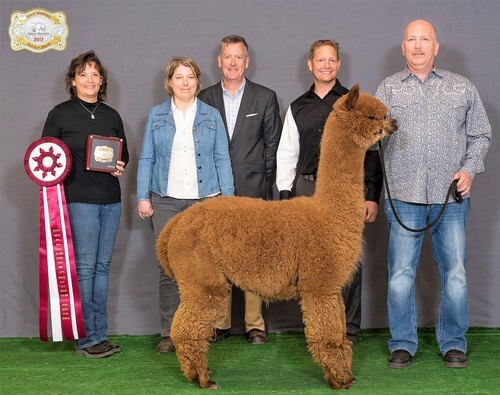 Magna Carta is bred to Liberty’s Manassas, a Judge’s Choice winner and 15X Champion male for a July 2019 cria. Call us CRAZY for offering this exceptional girl to add to your farm. Don’t miss this opportunity!